Scenic view near Lake Wallenpaupak in Pocono Mountains, Pike County PA; photo by Judy Malley on Flickr (noncommercial use permitted with attribution / no derivative works). Representing Pennsylvania is Hazleton soil (named for the city of Hazleton in east central Pennsylvania). Hazleton soils occur in half of the counties of the state (more than 1.5 million acres) in woodland, cropland, hay and pastureland. Hazleton is one of more than 1000 types of soil that are mapped in Pennsylvania. Official state fauna and flora are all found on Hazleton soils - it supports the diversity of Pennsylvania. 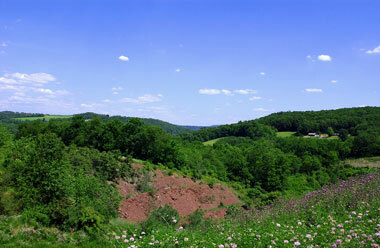 Hazleton Soils are found in the Ridge and Valley, Allegheny Mountain, High Plateaus, and Pittsburgh Plateaus Physiographic Provinces in Pennsylvania. Forests on Hazleton soils are mixed northern hardwoods that include white and red oak, hickory, ash, maple, and black cherry. An Act selecting, designating and adopting the Hazleton soil series as the official soil of the Commonwealth of Pennsylvania by prime sponsor Representative Cox was referred to STATE GOVERNMENT, March 10, 2009 (HOUSE BILL No. 833 Session of 2009). Section 1. Official State soil.The Hazleton soil series is hereby selected, designated and adopted as the official soil of the Commonwealth of Pennsylvania.